iCash lets you create, print and export several types of reports, the Balance sheet, the Profit and loss statement, the Profit and loss summary, the Account Statement and the Tax report. All reports are available through the report pull-down menu. 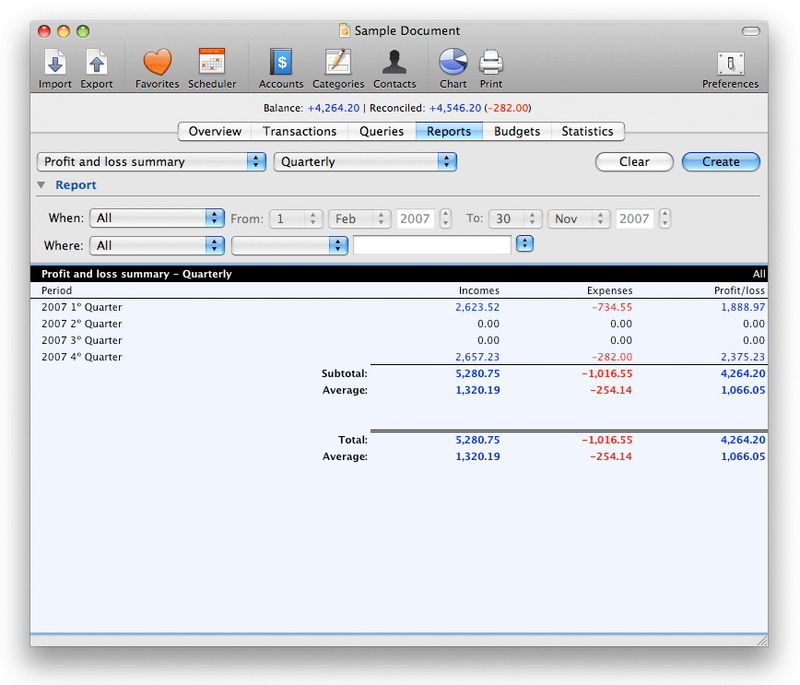 The balance sheet and the profit and loss reports are the primary accounting reports that you will need. To print your report select the File | Print menu. To export your report to a file select the File | Export | Report menu. The Balance sheet is a snapshot of your holdings at a given point in time. The balance sheet shows your assets, your liabilities and your investments. 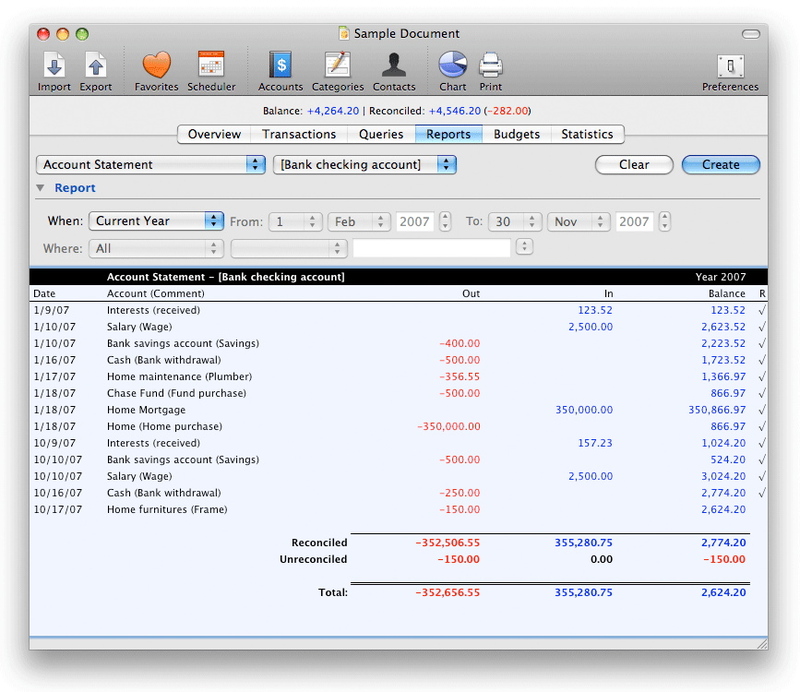 The balance sheet shows these figures on a specific date or for a date range. In simple terms it shows where everything is. 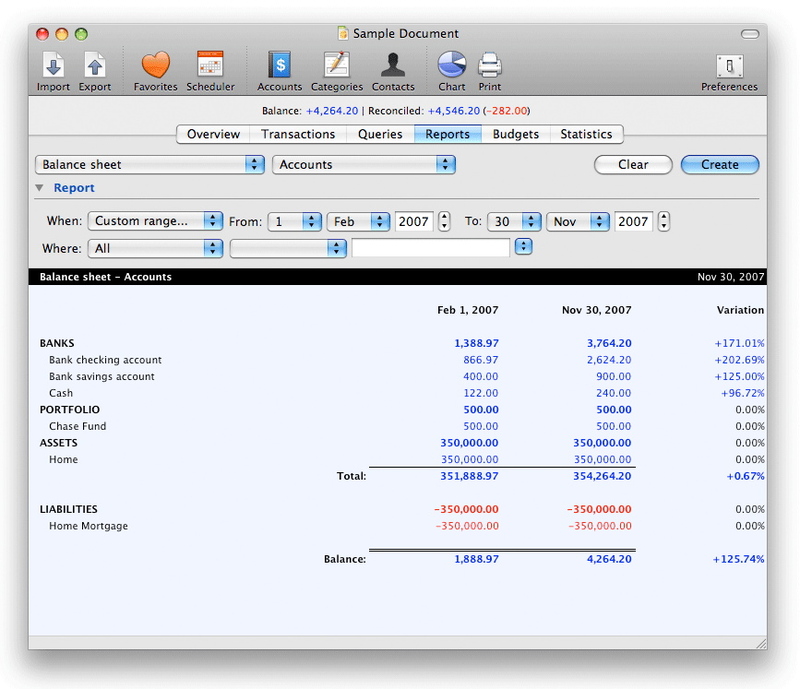 The balance sheet is a fundamental accounting report and forms the basis for many other reports. The balance sheet is an excellent method for viewing your finances' health. You can choose from the Summarized report that shows account types only, the Accounts report that shows types and all related accounts or the Categories report that shows types and all related categories. In addition you can create a report at a given date or for a date range. By choosing a date range you simply ask iCash to calculate the balance at two different dates and the variation between them. In other words, you can get for example January 1st and December 31th balances on the same sheet along with the variation percentage between those two dates. The Profit and loss Statement provides one of the most valuable financial reports to view your finances. 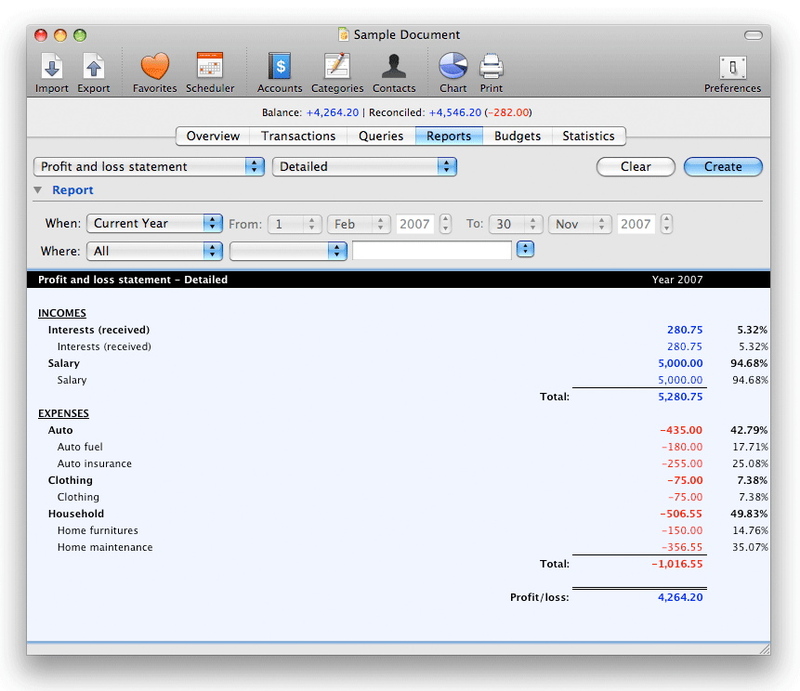 The Profit and Loss Statement is the most used business report. Simply stated the P & L, also commonly referred to as the Income Statement, is a snap shot or balance of money as it flows over a specific period of time, such as a month or a year. The basic formula is revenues minus expenses equals income/profit. The P & L breaks out 1) revenues or income 2) expenses and 3) profit or what is left over. A Profit and Loss statement is the easiest way to tell if you have made a profit or taken a loss over a given period of time. You can choose from the Summarized report that shows account types and categories or the Detailed report that shows types, categories and all related accounts. This report also displays the ratio for each account and category with respect to the type it belongs (Incomes or Expenses). The Profit and loss Summary is a variation of the previous report but displaying Incomes, Expenses and P&L per periods of time. Available periods are 'Monthly', 'Quarterly', 'Semiannually' and 'Annually'. The Account Statement report provides an easy way to view your Bank account activity showing all transactions debited or credited along with corresponding balance for the time period you selected. The Tax Report provides several reports for collected and refundable taxes. It displays each transaction date, payee data, gross amount, taxes and total.